Review: If directror Johnnie To shoots a crime thriller in Mainland China, than this inevitably will lead to concerns in respect of the end product. To's signature is that of an unflinching storyteller, who brings to screen his own vision of a realistic portrayal of good and evil through captivating and blunt, at times extremely nihilistic, mental outpourings. But China's censorship would never allow the villains also showing their good sides or even surviving at the end. Especially not if things revolve around drugs. So, how did Johnnie To manage to deliver one of his most engaging movies ever? The answer seems to be that he draw creativity from the restrictions imposed on him. That's just the reason why To is so far ahead of his competitors. First of all: Those who worry that shifting the setting from Hong Kong to Tianjin won't allow this to be a real Milkyway flick can rest assured. Where it needs to everything still looks like the production company that gave us such gems like "Expect the Unexpected" or several movies by To himself, like "Exiled" or "Mad Detective". But there are also slight differences. The grey in grey of Tianjin, the constant smog, the pollution of the big city, all of this brings a new color to To's paint-box, and yet everything feels familiar. Saying that "Drug War" is a dark movie even would be an understatement. Because this time there is also a strange coldness and remoteness added which probably might be too much for some viewers, too. Nevertheless, the movie doesn't give you any time to mentally formulate the weakness of an all-apparent reserve of the characters. Additionally, despite the lack of elaboration, we also have at least some way of relationship to the characters which more than anywhere else proves to be true at the ending, because naturally some individuals won't survive that one. 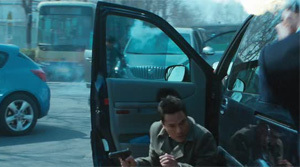 This is mainly the achievement of the great actors, above everyone else Sun Honglei ("A Woman, a Gun and a Noodle Shop"), who might remain a bit colorless as a cop but who, making up for it, brings out the best of himself in the roles he has to play in the movie, especially as drug pusher HaHa. That's also where it shows that To absolutely needs to make an intricate espionage thriller in the future, because his movies can in fact almost be called such and deliver a serious amount of thrill. 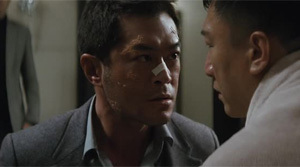 Then there is Louis Koo ("Accident", "Overheard 2"), he plays his part with the necessary question marks involved. How trustful is Timmy really, is he just an opportunist after all, who, comes the next best chance, stabs you in the back? To be seen in the supporting roles are the usual Milkyway subjects. What's striking is that almost all of the Hong Kong guys are villains while the Mainland Chinese are depicting the good guys. An interesting role reversal as it has been just the other way round in To's thrillers so far. Yet, the villains are more colorful and even look cooler during the shootouts. But that's not the only thing where To nimbly sidesteps Chinese censors. The action is just fantastic and the showdown one of the best the director has created thus far. The long gunfight simply has the mix of rhythm and coolness to it that is so characteristic for To, while the action still remains incredibly realistic at all times. Maybe apart from some people being able to take one bullet too many... Furthermore, there are some deliberately funny moments, like the policemen who are followiong a truck for days already, almost glued to the rear bumber, yet remaining undiscovered, or the anime-like HaHa. Still, realism is running through the whole film and is the reason for events being so engaging. Great pictures along with some fan service in the shape of the tactical approach of suspects by the police units or the bloody action complete the positive overall impression along with a well done soundtrack by Xavier Jamaux. "Drug War" is most of all enthralling from start to finish because of its cleverly devised story, in which a wide drug network is to be brought down. Thus, the story almost reaches epic scales towards the end. 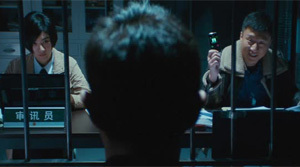 That the movie always had censors breathing down its neck is nowhere to be seen, except if you are looking for it - for instance Zhang has Timmy standing front of his gun and no reason to be considerate, yet he remains the good cop, just as expected from a good Chinese. Does this give the movie a bland aftertaste? Not at all and that's the big surprise. Johnnie To sails his movie around censorship problems, even leaves room for interpretation of good and evil, and delivers a model action thriller which proves that a Hong Kong/China collaboration can bear worthwhile fruits.